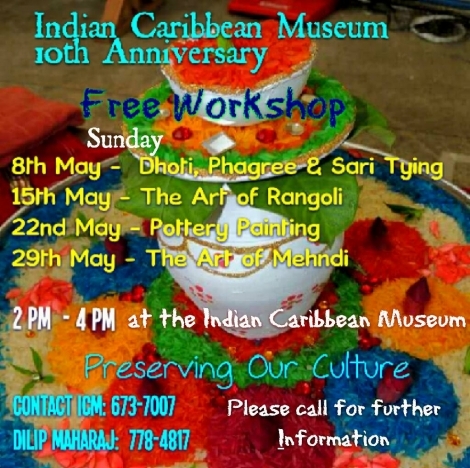 The Indian Caribbean Museum (ICM) is a unique and specialized non-governmental institution that is owned and operated by the Sanatan Dharma Maha Sabha Inc. of Trinidad and Tobago by Act 41 of 1952. It was established in 2006 and opened to the public by the Honorable Winston Dookeran, Member of Parliament for St. Augustine on May 7th, 2006. The museum seeks to capture and highlight the experiences of the East Indians who came to the Caribbean between the years 1838 and 1917 as indentured labourers, many of whom have made these lands their new home never returning to India. In fact, roughly seventy-five percent of those who came chose to remain in the Caribbean. The ICM can be described as a national treasure, a keeper of culture, a window to the past and an opportunity to see history come alive. It is the only one of its kind in the Caribbean and already over fifty thousand persons, both foreign and local, have visited our collection which comprises old musical instruments, traditional clothing, religious texts, emigration documents, books on indentureship throughout the Caribbean, an Art gallery featuring the works of local East Indian artists as well as a library with close to three hundred publications. The benefits derived from this museum are numerous as those of the older generation can recall their past experiences by viewing the museum’s rich cultural collection. Students can research assignments for examination purposes or others can simply visit us or surf the web to find out more about the museum. The beneficiaries of this institution go beyond the immediate community as its varied collection is national in scope. Despite its focus on the East Indians, the museum embraces visitors from all ethnic groups and cultural backgrounds. It has also welcomed many foreign dignitaries, diplomats and other personnel of state agencies and private sector conglomerates who have visited our shores from time to time. School children, from kindergarten to university are our most frequent visitors. In order to make the museum more user friendly, accessible and visible, its website will now be available to provide global access. We hope that you would visit our website regularly and invite your friends, family members and other interested persons to do the same. In the year 2006 a dream nurtured by Mr. Satnarayan Maharaj came to reality. 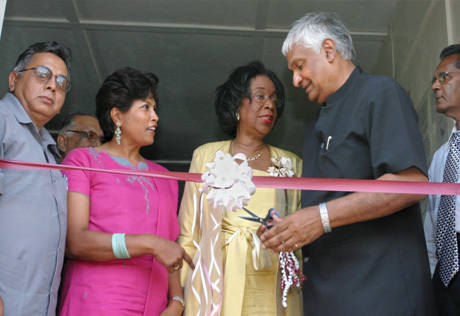 This dream was the establishment and formal opening of an “Indian Museum” today known by many as the “Indian Caribbean Museum of Trinidad and Tobago.” Located in the rural setting in the village known as Waterloo in central Trinidad, the Indian Caribbean Museum is the only one of its kind dedicated to the preservation of the material history of over one million descendents of East Indian/South Asians in the Caribbean. Sat Maharaj could safely be described as the most dynamic Hindu Leader the country has ever had. He took over the position of Secretary General of the Sanatan Dharma Maha Sabha (S.D.M.S.) from the late Mr. Simbhoonath Capildeo in the year 1977 and he has almost single-handedly transformed this organization into one of the most successful institutions in the country. Mr. Sat, as he is fondly called, is an astute visionary. He has embarked on the herculean task of re-shaping the Maha Sabha school system from ‘cowsheds to mansions’. 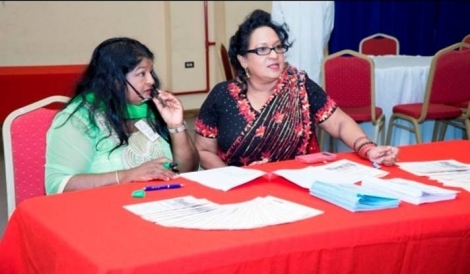 Not only can the Maha Sabha boast of its achievements in Primary Education in Trinidad but Secondary and Early Childhood education as well – 43 primary schools, 5 secondary schools and 18 Early Childhood Centres as of 2014. One cannot help but remember Mr. Maharaj for his victory at the Privy Council which saw the change of the Trinity Cross, the highest National Award in Trinidad and Tobago to the Order of Trinidad and Tobago; his struggle to set up in Trinidad a Hindu radio station which was granted only after the Privy Council ordered that a licence be granted to the S.D.M.S. Mr. Maharaj was instrumental in having The Ministry of Arts and Culture changed to The Ministry of Arts and Multiculturalism. Only recently the biography of Sat Maharaj was launched at a large gathering. The writer, Dr. Kumar Mahabir, Anthropologist and author of over nine books and several publications so skilfully penned the life and times of Mr. Maharaj. It is a book that everyone should possess, as it traces the journey of a man who will leave a legacy to the country of his birth. I am very pleased to be here today and to have a role in launching what I believe is a very necessary facility in this country. The Indian-Caribbean Museum of Trinidad and Tobago will make a significant contribution to our islands’ collective cultural landscape. Ladies and Gentlemen, you may be wondering why NGC chose to become involved in such a project. NGC believes in supporting all projects that contribute to the preservation of our indigenous heritage and our history. It is why we are strong supporters of and contributors to events such as the Tobago Heritage Festival and unsponsored steelbands. The preservation of all cultures contained within our country is vital. While our youth embraces other First World Cultures, we must realise that this may overwhelm our own, organic, hundred years-old cultures. In this sense, I think this Museum will be the tool that will allow us to discover and indeed embrace the multifaceted culture of the East Indian Diaspora of Trinidad and Tobago and the Caribbean. This museum, I firmly believe, will also serve to bridge a fundamental gap between generations – those who have gone ahead and those who are still to come. I am also pleased to note that NGC’s initial commitment to support this museum was made last year, at an historic time in our own corporate history. In 2005, NGC celebrated its 30th anniversary. As part of those celebrations, we developed a special programme of corporate giving. We wanted to support projects that would make a sustainable difference to the recipients and that would continue to have an impact on them and on the society over the next 30 years. We believe this museum will do just that. We hope that even as NGC looks forward to a new and exciting phase of growth and development over the next 30 years, that this museum will also flourish and grow and become a significant Caribbean landmark, educational institution and repository of Indian history and culture. I should note that NGC has an additional reason for supporting this project because the museum will be located in Waterloo, which is one of our pipeline communities. In closing, Ladies and Gentlemen, I want to congratulate the Maha Saba for their vision and perseverance in bringing this project closer to reality. Ladies and Gentlemen, on behalf of the Board, Management and Staff of NGC I want to extend best wishes for the enduring success of this museum. I hope that everyone will visit and benefit from this important new addition to our cultural infrastructure. Thank you.